MR HH 600 VHF radio with GPS & DSC is Cobras first handheld radio that shows your GPS coordinates and automatically transmits them with DSC calls to notify the Coast Guard or other vessels of your exact position in case of emergency. This life saving radio also features a floating orange core so its easy to see in water and has a built-in flashlight and emergency strobe. Built-In GPS Receiver Shows GPS coordinates on screen and automatically sends GPS location with DSC calls. DSC (Digital Selective Calling) Compliant with the latest FCC specifications for Class-D VHF Radios. DSC features on this Class-D radio include: A Dedicated Channel 70 (DSC Channel) Receiver, GPS Position Display Capability, Illuminated Distress Button. Easy MMSI Entry, Position Input Reminder, Coast Guard DSC Check Capability. Now includes voice dialing and Caller ID. FLOATING Never lose your radio. Floating design and orange core makes retrieving radio easy if dropped overboard. Rewind-Say-Again® Replay missed VHF calls. 6 Watt VHF Select between 1, 3 and 6 Watts for short and long range communication. Light The radios light can be used as a flashlight or S. Signal, and the light flashes when dropped in the water. Submersible Meets JIS8 (IPX8) standards; submerible for 30 minutes in more than one meter deep water. All NOAA Weather Channels Instant access to national All Hazards and weather information, 24 hours a day. Weather Alert Alerts with an audible tone and visual alarm if threatening weather is nearby. MOB (Man Over Board) Dedicated MOB key marks and memorizes position information if a crew member falls overboard. Noise-Canceling Microphone Blocks background noise for clearer conversations. Basic Navigation Basic navigation features include digital compass, waypoint navigation, course, speed, etc. Canada & International Channels Allows operation on any of the three (3) different channel maps established for these areas. BURP Vibrates water out of the speaker grill and improves speaker performance. External Speaker/ Microphone Jack Connect Cobra speaker mic accessories for hip or body worn operation. Instant Channel 16/9 Instant access to channel 16 and channel 9 for emergency situations. NMEA Out NMEA 0183 outout to display other vessels and their information transmitted by DSC on your chartplotter. Unlimited Memory Channels Allows programming of unlimited channels for easy retrieval or scanning. Tri-Watch Scans three channels - channels 16, 09 plus one working channel. Channel Names Friendly VHF channel names under the channel number. Scan Scan all channels to find conversations in progress. Memory Scan Scan channels programmed in memory to find conversations in progress. Signal Strength Meter Shows the strength of the receiving and transmitting signal. Button/Key Lock Locks function buttons/keys to eliminate accidental change of settings. Battery With Charge Contacts Allows charging of batteries in unit. Illuminated Function Keys Allows high visibility of function keys. Selectable Key Tone Beep Key tone press beeps can be turned off for silent operation. Large, Illuminated LCD Display Allows high visibility of display. 5.71 H x 2.83 W x 1.87 D (not including antenna) (131 mm x 72 mm x 47 mm). 1000 mAh Lithium Ion Rechargeable Battery. Locking Desktop Charger with AC/DC adapters. Removable Spring Loaded Belt Clip. The item "Cobra HH600E VHF DSC GPS Bluetooth Floating Handheld Marine Radio" is in sale since Wednesday, June 28, 2017. 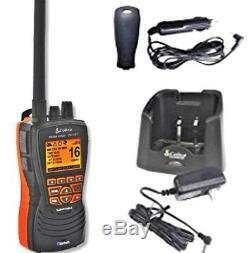 This item is in the category "Mobile Phones & Communication\Radio Communication Equipment\Marine & Aircraft Radios". The seller is "pacermarine" and is located in Aldershot, Hampshire. This item can be shipped to United Kingdom.